Imitation is the sincerest form of flattery. Or, at least, that’s what the mysterious collective known as ‘they’ often say. If what ‘they’ say is true, then the MMO industry is absolutely overflowing with approbation. Alganon is a new MMO fresh off the presses that takes its WoW-cloning very seriously. From the moment you enter the character creation screen, your sense of promnesia is so palatable that the game might as well be a sheep named Dolly. The art style. The combat. The emotes. Algonon doesn’t even try to pretend that it’s anything other than a World of Warcraft knock-off. Of course, trying to be just like WoW is certainly nothing new. Korean MMOs have made an industry out of it (i.e. Runes of Magic). But Alganon isn’t an Asian import; it was created by Arizona-based developer Quest Online. And what makes Alganon unique in its, uh, sameness, is the fact that it’s a remarkably well done clone. I have to admit that in the short time I played Alganon during beta, its familiarity was almost comforting. Sure, it was a bland comfort, like a bowl of oatmeal. But I’ve certainly played much worse. Which left me wondering, why? If you’ve got the talent, skill and budget that Quest Online obviously has to make a superb WoW copy, why not use those resources to create something wholly new and original? Was it a shrewd business decision? Do they think that players aren’t ready to accept a radically different MMO? Is the MMO market so competitive that it’s too risky to veer too far from the accepted standard? What are your thoughts on this phenomenon? 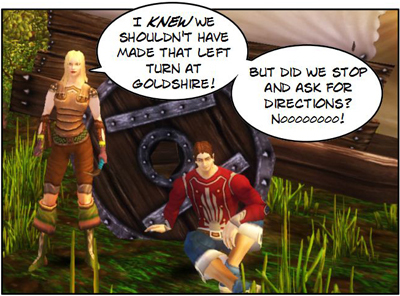 Will we ever find our way out of Azeroth? This entry was posted by Leslee	on Tuesday, December 1st, 2009 at 3:35 pm	and is filed under Genres & Themes. The fact of life with MMOs and their popularity and the money they make is that it’s only loosely based on how good they are. Skill in execution of an original idea are trumped by community and mob rules. It’s as random a success rate as that of word-of-mouth advertising, one supposes. I’ve pretty much lost faith in the ‘voting public’ as a whole, so as much as I dearly wish it weren’t so, I know we’ll never escape Azeroth or it’s clones, at least not anytime in the near future. What I really don’t understand about the business side of these things is what exactly makes them think that cloning WoW get players? Why would anyone switch from WoW to an identical game with fewer players and without five years of play behind it? And hearing someone with limited MMO exposure talk, it’s often apparent that they don’t realize different is *possible*. It is what it is, until someone shows them something different. The changes they look for are something exactly the same, except you jump 10% higher (or whatever their pesky annoyance was). So to make something so obviously identical is very comforting. It’s not literally the same game, so it will attract players who want to try something different (but really don’t). Here’s the sad part about all this. You’ll see the WoW imitators die off when an MMO comes out that trumps it. But then people will just imitate that MMO. No matter how fresh, or new, or different, it’ll be copied and copied and copied until itself becomes just like WoW before it, and this cycle will happen again and again.